An abandoned bicycle takes up valuable space at a bike rack.| Image via the Bicycle Coalition of Greater PhiladelphiaYou have all seen them. Those rusty, junky, beat-up bicycles with half their parts missing, locked to a bike rack and taking up precious space. Luckily, these pesky eyesores are slated to become a thing of the past, as Philadelphia launches the Abandoned Bike Clean-up project. Led by the Mayor’s Office of Transportation and Utilities (MOTU) and the Philadelphia Streets Department, the Abandoned Bike Clean-up project aims to remove abandoned bikes from city streets, freeing up bike rack parking space for in-use bicycles and increasing sidewalk space for pedestrians. Starting on July 23, abandoned bikes will be tagged with notifications of removal and the owners will have one week to remove them before the city picks them up. All abandoned bikes will be donated to local charities to be refurbished and reused. Help MOTU get a head start by identifying unused bicycles in your own neighborhood. 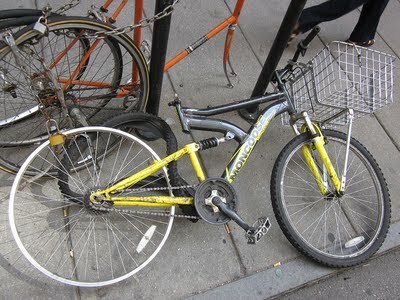 Abandoned bikes are defined as having missing or damaged parts, and have been locked in the same spot for a month or longer. If you have seen one of these vehicles where you live, call 311 and be prepared to provide the bike's physical description and location. With any luck, you might never have fight abandoned wheels for a space at the bike rack again. Learn more at the MOTU website.